LEAD are the foremost suppliers of professional laundry equipment, representing brands including Jensen, Speed Queen, Girbau, Ipso. 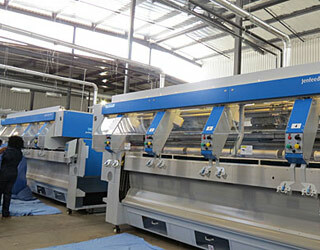 The products range in application from those used in coin-operated laundries to sophisticated tunnel washers found in the world’s largest industrial laundries, and it’s customers range in size from the smallest Bed and Breakfast to Central Processing Plants handling linen in hygienic conditions. 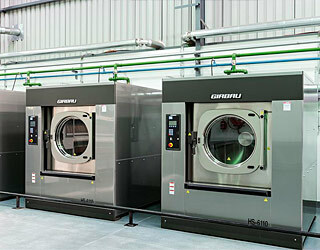 Generally, although not exclusively smaller capacity laundromat equipment; typically found in coin-operated laundries, flats or townhouse complexes, Caravan parks, Holiday resorts, University residences , Restaurants, Lodges and Game Parks, Health Spas and smaller Bed and Breakfast establishments. Industrial equipment catering generally but not exclusively to the following market sectors: Hospitality, Healthcare, Mining, Factories, large commercial Central Laundries, and general industry. Also appropriate for more specialised applications requiring specific laundering processes, such as Barrier Washers for the Healthcare industry. Central processing facilities for specialist applications all of which have large volumes in common. Generally found locally in large central processing plants servicing the Healthcare Industry. Continuous Batch Washer (CBW) Systems including Tunnel Washers, Conveyor Systems, Barrier Washers, High production through feed roller irons/feeders and folders amongst others.